Jesus Christ calls us in His voice and His name. He seeks and gathers us. He teaches us how to minister in love. In my case, counting sheep doesn’t make me sleepy. I worry about missing or losing one, and that keeps me awake. 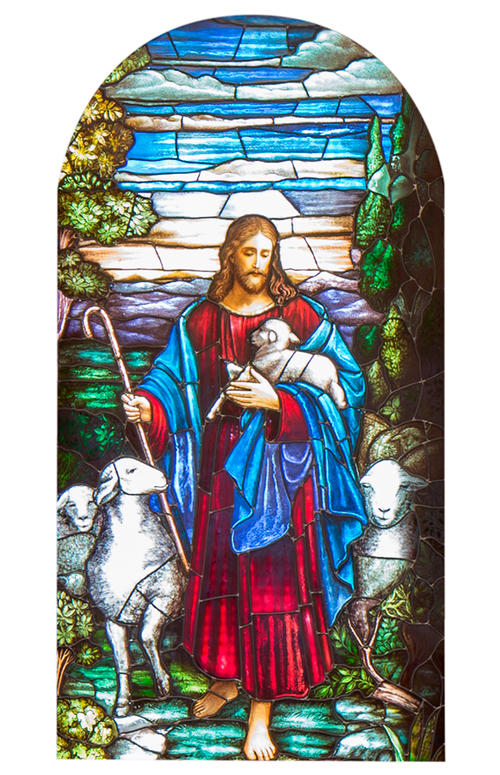 At this Easter season, we celebrate the Good Shepherd, who is also the Lamb of God. Of all His divine titles, no others are more tender or telling. 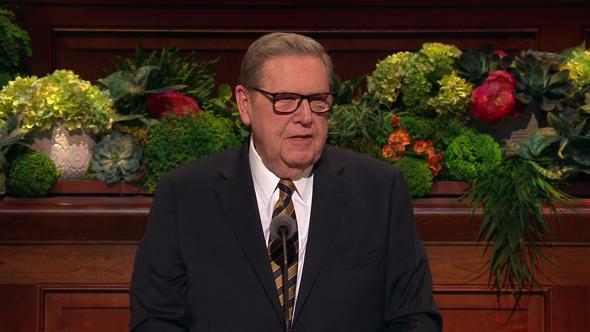 We learn much from our Savior’s references to Himself as the Good Shepherd and from prophetic testimonies of Him as the Lamb of God. These roles and symbols are powerfully complementary—who better to succor each precious lamb than the Good Shepherd, and who better to be our Good Shepherd than the Lamb of God? 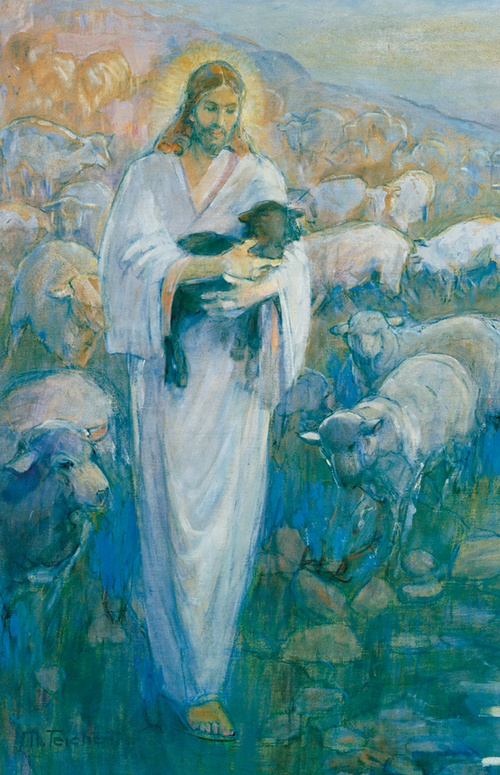 “For God so loved the world, that he gave his only begotten Son,” and God’s Only Begotten Son laid down His life in willing obedience to His Father.3 Jesus testifies, “I am the good shepherd: the good shepherd giveth his life for the sheep.”4 Jesus had power to lay down His life and power to take it up again.5 United with His Father, our Savior uniquely blesses us, both as our Good Shepherd and as the Lamb of God. As our Good Shepherd, Jesus Christ calls us in His voice and His name. He seeks and gathers us. He teaches us how to minister in love. Let us consider these three themes, beginning with Him calling us in His voice and His name. First, our Good Shepherd “calleth his own sheep by name. … They know his voice.”6 And “in his own name he doth call you, which is the name of Christ.”7 As we seek with real intent to follow Jesus Christ, inspiration comes to do good, to love God, and to serve Him.8 As we study, ponder, and pray; as we regularly renew sacramental and temple covenants; and as we invite all to come to His gospel and ordinances, we are hearkening to His voice. 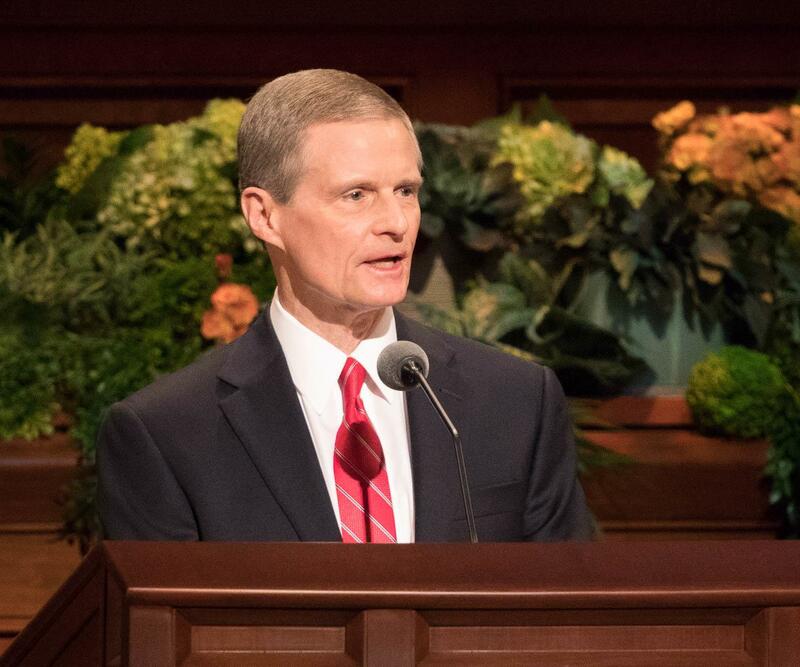 In our day, President Russell M. Nelson counsels us to call the restored Church by the name Jesus Christ revealed: The Church of Jesus Christ of Latter-day Saints.9 The Lord said, “Whatsoever ye shall do, ye shall do it in my name; therefore ye shall call the church in my name; and ye shall call upon the Father in my name that he will bless the church for my sake.”10 Across the world, in our hearts and homes, we call upon the Father in the name of Jesus Christ. We are grateful for such generous blessing of our home-centered, Church-supported worship, gospel study, and wholesome family activities. 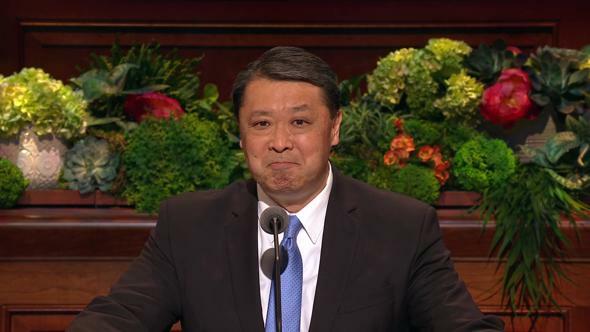 Our Savior told His New Testament disciples, “Other sheep I have, which are not of this fold.”15 In the Americas, the resurrected Lord testified to Lehi’s covenant children, “Ye are my sheep.”16 And Jesus said yet other sheep would hear His voice.17 What a blessing the Book of Mormon is as another testament witnessing the voice of Jesus Christ! Our Good Shepherd rejoices when we exercise individual moral agency with intention and faith. Those in His fold look to our Savior in gratitude for His atoning sacrifice. We covenant to follow Him, not passively, blindly, or “sheepishly,” but instead desiring with all our hearts and minds to love God and our neighbor, bearing one another’s burdens and rejoicing in one another’s joys. As Christ freely dedicated His will to the will of the Father, so we reverently take upon us His name. We gladly seek to join His work of gathering and ministering to all of God’s children. Father Abraham, who established covenant blessings for all the nations of the earth, experienced what it meant to offer his begotten son. “And Isaac spake unto Abraham his father, and said, My father: and he said, Here am I, my son. And he said, Behold the fire and the wood: but where is the lamb … ? A dear friend shared how she gained her precious testimony of the Atonement of Jesus Christ. She grew up believing sin always brought great punishment, borne by us alone. She pleaded to God to understand the possibility of divine forgiveness. She prayed to understand and know how Jesus Christ can forgive those who repent, how mercy can satisfy justice. This promise of hope and comfort includes our day. Brothers and sisters, our Good Shepherd calls us in His voice and in His name. He seeks, gathers, and comes to His people. 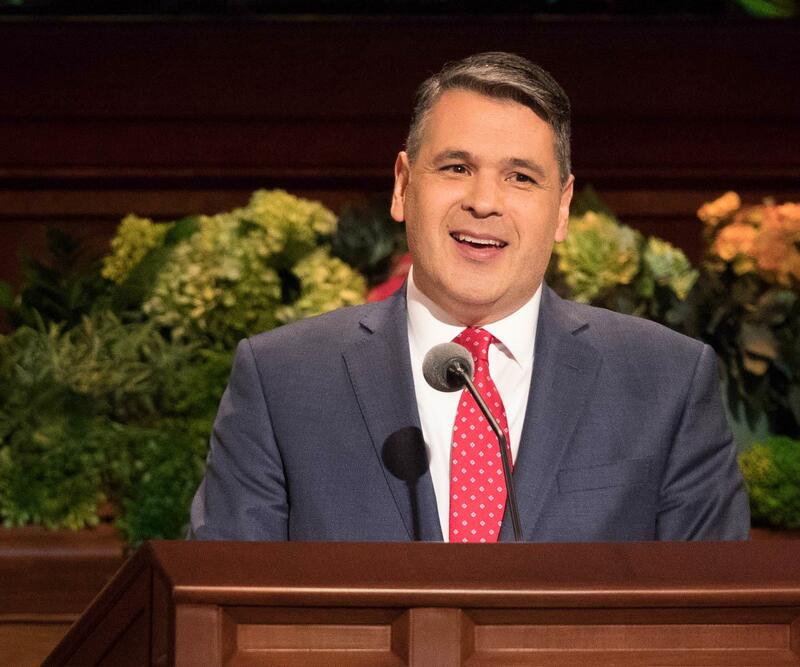 Through His living prophet and each of us, He invites all to find peace, purpose, healing, and joy in the fulness of His restored gospel and on His covenant path. By example, He teaches the shepherds of Israel to minister in His love. As Lamb of God, Jesus’s divine mission was foreordained and rejoiced in by apostles and prophets. His Atonement, infinite and eternal, is central to the plan of happiness and the purpose of creation. He assures us that He carries us next to His heart. I testify of Him, our perfect Good Shepherd, the perfect Lamb of God. He calls us by our name, in His name—even the sacred and holy name of Jesus Christ—amen. Alma 5:38; see also Alma 5:37, 39, 59–60. See Moroni 7:13; Doctrine and Covenants 8:2–3. 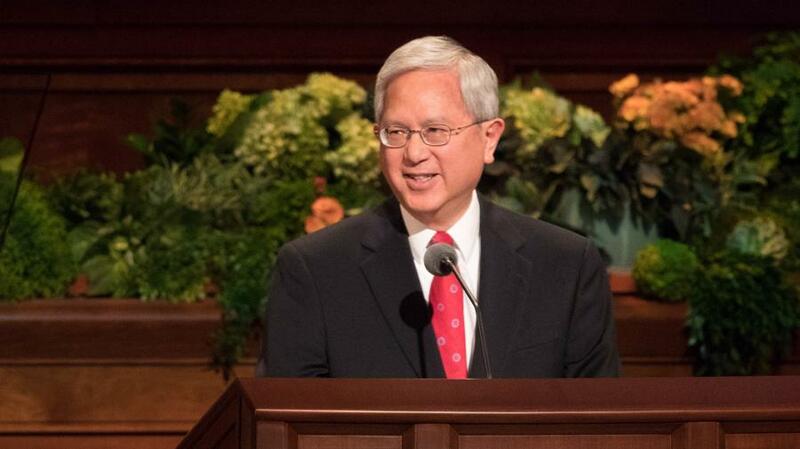 See Russell M. Nelson, “The Correct Name of the Church,” Ensign or Liahona, Nov. 2018, 87–89. 3 Nephi 27:7; emphasis added. Luke 15:4, emphasis added; see also Doctrine and Covenants 18:15. Ezekiel 34:12; see also Jeremiah 31:10; Ezekiel 34:6, 11–14; Micah 5:8; Matthew 10:6; 15:24. 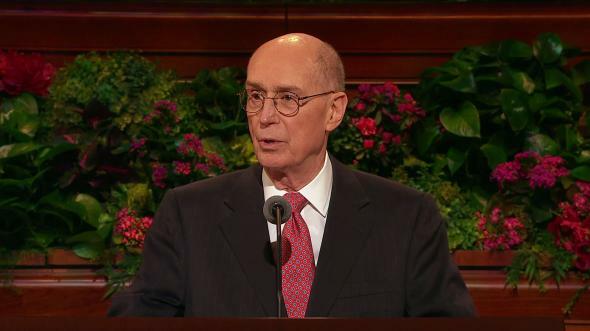 These prophecies of scattering and the prophecies and promises of covenant gathering are a consistent theme of the prophets, including President Russell M. Nelson. John 10:16; see also 3 Nephi 15:21; 16:1, 3; Doctrine and Covenants 10:59–60. 3 Nephi 15:24; see also 3 Nephi 15:17, 21. See 3 Nephi 16:1, 3; see also Doctrine and Covenants 10:59–60. See 2 Nephi 31:13–14, 21. 2 Nephi 31:5; see also Alma 7:14. See Malachi 4:5–6; John 15:9–13; Mosiah 25:18; Helaman 11:21; see also Russell M. Nelson, “Hope of Israel” (worldwide youth devotional, June 3, 2018), HopeofIsrael.ChurchofJesusChrist.org; Russell M. Nelson, “The Gathering of Scattered Israel,” Ensign or Liahona, Nov. 2006, 79–82. John 21:15–17; see also the entire chapter. See Jeremiah 23:1; 50:6, 44. See Isaiah 56:11; Ezekiel 34:2–6. 3 Nephi 14:15; see also Matthew 7:15; Alma 5:60. 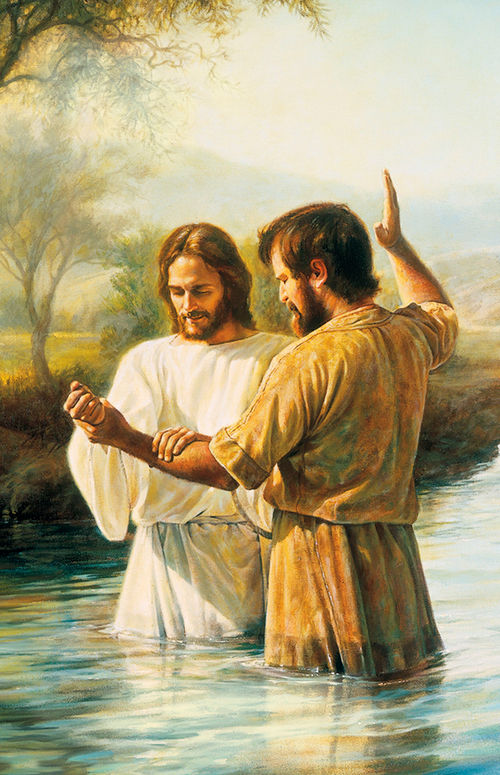 See 2 Nephi 9:10–12. By conquering physical death and spiritual separation, the Lamb of God makes possible the gathering of all so there is, in time and eternity, one Shepherd. Genesis 22:7–8; see also Jacob 4:5. John 1:29; 1 Nephi 11:21. Mosiah 14:6; see also Isaiah 53:6. Conversation with Pornthip “Tippy” Coyle, Feb. 2019, used with permission. Come, all ye scattered sheep, and listen to your Shepherd. See Revelation 15:3; Doctrine and Covenants 133:56.